Do what YOU want to do. Retire Happy NOW! There's that restaurant down the street that just opened, the one with the patio and the live music. Time to try it out, and maybe get down to the pub afterwards. Or maybe spend a casual night in, and pick up some flowers for someone special. During the day, every decision you make is based on what you should do or what you have to do. The Highlight Years are when you decide what you want to do. Everyone’s idea of retirement is different. But one thing’s for sure is that you want to be happy. Don’t delay your retirement planning any longer. Retire Happy Now is committed to providing you with the mathematic and scientific methods for securing a successful and happy retirement. Request Your Complimentary, No Obligation Review! How should you retire? Do you know what you’re going to get? Do you know how you’re going to spend your retirement? Wonder how much should you leave your kids? Do you know who the happiest people in retirement are? RECEIVE A FREE RETIREMENT GUIDE! Understand the Retirement Alpha concept. 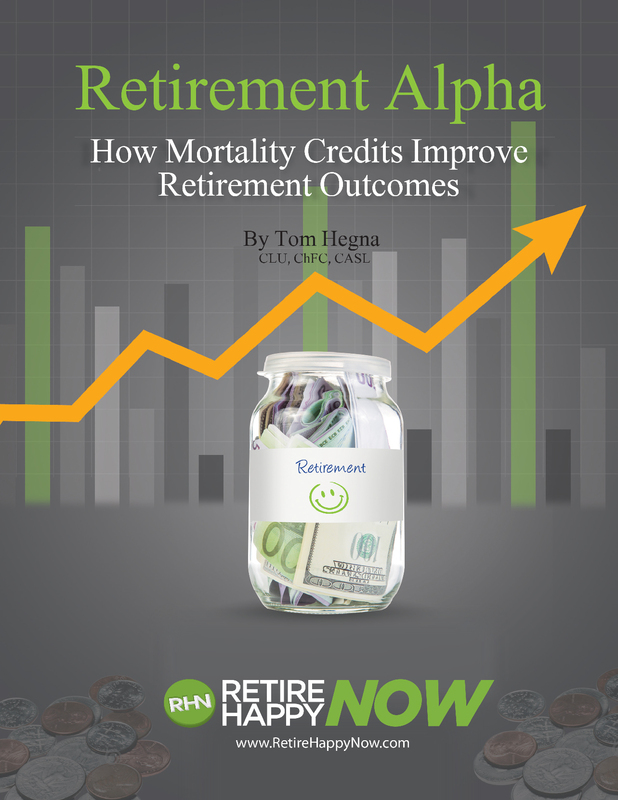 Learn how mortality credits improve retirement outcomes. Get your free copy today! The content in this presentation is for informational and educational purposes only and does not constitute legal or tax advice. Customers should consult a legal or tax professional regarding their own situation. This presentation is not an offer to purchase, sell or exchange any product. Insurance products and any related guarantees are based upon the claims paying ability of an insurance company. Insurance policy applications are vetted through an underwriting process set forth by the issuing insurance company. Some applications may not be accepted based upon adverse underwriting results. Insurance policy applications are vetted through an underwriting process set forth by the issuing insurance company. Premium payments will vary. Some applications may not be accepted based upon adverse underwriting results. Death benefit payouts and insurance product guarantees are based upon the claims paying ability of the issuing insurance company. Complete the information below to receive your free guide! Check your inbox for instructions to claim your copy and receive a personal call from a professional to start planning your happy retirement now!